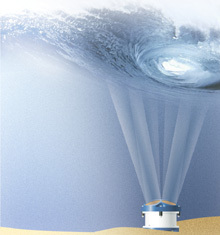 The 300 kHz long-range Horizontal Acoustic Doppler Current Profiler (H-ADCP) is a narrow beam acoustic monitoring system that “looks” out horizontally from an offshore or coastal to measure near-surface water currents and multi-directional waves. This revolutionary tool uses patented BroadBand signal processing to obtain an optimal combination of range, resolution and data quality, which simply cannot be replicated using NarrowBand products. The H-ADCP measures currents at up to 128 individual points at up to 200 meters horizontal range, offering a clear illustration of the complete flow structure. 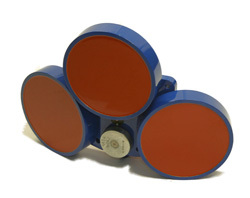 Teledyne RDI’s Workhorse Waves Array is an innovative, cost-effective upgrade that allows you to take your Teledyne RDI ADCP to the next level.